Visitor guide to St Abbs Head in the Scottish Borders, includes great info on walks around the are, sleeping and eating, and useful travel and accommodation options. Three miles north of Eyemouth on the A1107 is the village of Coldingham, notable only for its medieval priory, founded by King Edgar in 1098, then rebuilt in the 13th century before suffering further attacks in 1545 and 1648. The remaining sections have been incorporated into the present parish church. Here the B6438 turns north and winds its way down to the picturesque little fishing village of St Abbs, nestled beneath steep cliffs. There's a little museum and a Visitor Centre for the Marine Reserve in the Old School House - open summer, hours vary with volunteer staff. 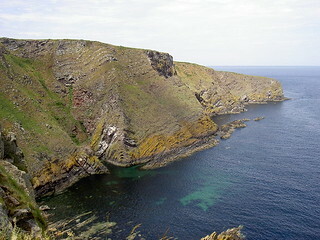 St Abbs is also a good base for divers wishing to explore the St Abbs and Eyemouth Voluntary Marine Reserve. There are a number of boats offering dive charters as well as birdwatching boat trips. Try Peter Gibson, Tel 018907-71681, Alistair Crowe, Tel 018907-71412, Billy Atkinson, Tel 018907-71288, or ask down at the harbour. A good place to eat if you're going to St Abb's Head is Northfield Farm Visitor Centre by the car park, which has a pleasant tea room with tables outside. There is also a good pottery and a gallery/artist's workshop. Hours vary. Just north of the village is the St Abb's Head National Nature Reserve (NTS), which comprises almost 200 acres of wild coastline with sheer cliffs inhabited by large colonies of guillemots, kittiwakes, fulmars and razorbills. To get to the reserve, follow the trail from the car park at Northfield Farm on the road into St Abbs. The path ends at the lighthouse, about a mile from the car park. An excellent coastal walk, from Burnmouth, south of Eyemouth, to St Abbs is described below. 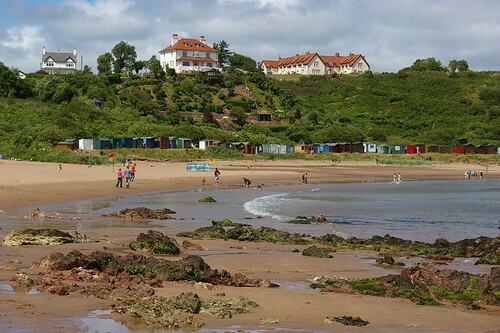 A side road turns off the B6438 at Coldingham and leads a mile down to the coast at Coldingham Sands, a tiny resort with a fine sandy beach. It's a popular spot for surfing and diving. The dive shop at Scoutscroft Holiday Centre, Tel 71669, rents out equipment and runs diving courses. Coldingham Sands is an award winning sandy seashore on Berwickshire's rocky coast near St Abbs Head. 4 hour walk that takes in the dramatic cliff top coastline and indigenous bird life. Sleeping and eating In St Abbs there's the excellent Castle Rock Guest House, Murrayfield, on the cliffs above the harbour, Tel 018907 771715; and nearby is Wilma Wilson's B&B, 7 Murrayfield, Tel 018907 771468. There is also bunkhouse accommodation at The Rock House Dive Centre, Tel 018907 71288, right on the harbour. At Coldingham Sands is Dunlaverock Country House Hotel, Tel 018907 771450, a small, comfortable hotel offering excellent food. There's also a youth hostel at Coldingham Sands, on the cliffs above the south end of the bay, Tel 018907 771298, open mid-Mar to end Sep. There are a few campsites, including Scoutscroft Holiday Centre, Tel 018907 771338, open Mar-Nov, which also rents diving equipment and offers courses. This semi detached self catering cottage, stone built cottage is located in the village of St. Abbs in the Scottish Borders and can sleep five people in three bedrooms. This end terrace, traditional stone built cottage is in the village of St Abbs on the Scottish borders, and sleeps four people in two bedrooms. Perfect for divers. Stylish semi-detached farm conversion of coach house on estate near Coldingham. Sleeps six people in three bedrooms.